I have over thirty years in the hospitality industry. I started out as a dishwasher at the age of sixteen and a steak house near my home. I was quickly promoted to the line and before long I was running the grill. Worked at various restaurants through high school. I attended the University of West Virginia as an Economics Major, still working in restaurants during that time. The passion for cooking was always there and after a while at West Virginia, I realized that I needed to follow that passion. I attended the Baltimore International College of Arts to pursue that passion. During the time as was attending culinary school, I was also working full time at The Polo Grill, one of the premier restaurants in Baltimore, learning from an amazing chef as well as learning at school. After graduating from culinary school I was promoted to sous chef at the Polo Grill. I left the Polo Grill and became the Executive Chef at Macgregor’s Restaurant in Havre de Grace, and quickly established that as one of the finest Restaurants in Harford County. After thirteen years at Macgregor’s restaurant I became the Executive chef for Parkhurst Dining at Maryland Institute College of Arts. I was there for five years when Parhurst got the contract for Loyola University in which I transferred to and was one of the opening managers for that account. I was at Loyola university for three and a half years developing that program from scratch. I then went on to Stevenson University as the executive chef for their dining program and was there for about two years, I am now the executive chef at the Atrium Restaurant for Erickson Living at Charlestown. I believe passion, hard work and dedication are the traits that make a chef. The culinary arts are a beautiful blend of creativity and standardization of methods. The biggest reward of being a chef is the positive experiences that you give to those you are cooking for. Nothing is more rewarding then someone saying” This is the best meal I have ever had”. We provide our guest with exceptional experiences and a lot of the time it is to celebrate important parts in their life. That is the rewarding part of what a chef does. I take that responsibility very serious, with the goal of giving every person that amazing feeling and experience. I attended Western School of Technology and Environmental science and was part of their Culinary arts program. The program allowed me to learn a lot of the basics I would learn in college and even alloted a few college credits for myself. During my sophomore year of high school, I started working in the Atrium at Charlestown, as a server. As I continued to work at Charlestown, I enrolled in the work study program at school, which allowed me to continue to finish high school, but to then go to a “full time job” and get work experience. I had the opportunity to work in cold prep as well as some of the hot line prep. I even got the opportunity to work in the kitchen a few nights during the week. Eventually a position as a Line cook opened up and I interviewed and got that position. From then on I put college on a hiatus and continued to work full time. Eventually I got to a point where I decided I was going to finish getting my Associates in Business Management at Anne Arundel Community College and worked full time, and went to school full time. During that time I moved up in roles from Line cook, to Lead cook, and then Sous Chef, and then in 2013 I obtained my AAS in Business Management. In 2014 I moved into the role of Executive Chef 1 of the Atrium Dining room. I had the opportunity to open a new kitchen to Signature Dining, which was very challenging but rewarding. I am now the Executive Chef of continuing care and am enjoying the different processes and procedures as well as leading a team in cooking the same food I love. I have worked at Charlestown for more than 17 years and have enjoyed cultivating relationships with the different teams and residents on campus. It has truly been a rewarding experience. The one thing I believe in, while working for these past years, is truly owning something. Own up to something whether its good or bad. Standing by and making excuses will not get you anywhere, but that personal responsibility will. In 2004 I graduated from Frostburg State University with a double major BS degree in Political Science and Philosophy. Following my graduation I spent four years at Enterprise Rent-a-car in their management trainee program where I had the privilege of becoming Assistant Rental Branch Manager. I have been cooking the majority of my life, starting professionally in 1996 for Gunning’s Seafood in Hanover Maryland. Throughout my career I have cooked for many restaurants throughout Maryland, some of which including Captain Bob’s Seafood in Ocean City Maryland, Della Note in Baltimore Maryland, Citronelle in Washington DC, Aramark in Washington DC, Wegmans Food Markets in Columbia Maryland, and most recently The Shanty Grille in Ellicott City Maryland. I started my career with Erickson Living at Charlestown in 2015 as Sous Chef for the Atrium Restaurant. Since then I have transitioned across multiple restaurants on this campus, having the pleasure to work as Sous Chef at the Fireside Restaurant, Executive Chef at the Terrace/Refectory and currently Executive Chef at the Shortline/Chesapeake. I believe that you have to be passionate about both people and food to be a Chef. I believe in training and developing my employees as an investment in both their future and the future of our great company. Everything that I have accomplished I owe to them and those who took the time to teach me. I would be unable to do this if not for the support of my wife and children who lovingly lend me to you so I can cook up my next dream here at Charlestown. After training at Adirondack Community College, I enjoyed a successful career at many popular dining venues, including the Sagamore Hotel & Resort in New York, the Equinox Hotel in Vermont, The Boar’s Head Inn in Charlottesville, Virginia, Kingsmill Resort in Williamsburg, Virginia and The Inn at Little Washington in Washington, Virginia a five star restaurant and inn. I started my career with Erickson at Riderwood and was there for twelve wonderful years. I started at Riderwood in 2003 as Chef de Cuisine of the Fireside & Potomac Café. Then after two years worked hard and was promoted to community Executive Chef. 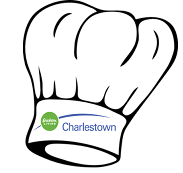 I am currently the community Executive Chef at Charlestown the first Erickson community. I have enjoyed my first three years here at Charlestown and look forward to many more. On March 23, 2011 I received my most treasured accomplishment my Executive Chef Certification through the American Culinary Federation. I believe that passion and integrity are the keys to be a successful chef. I am a chef that can stand by his product, admit his faults, be humble to my successes and recognize those who have helped me to be successful. So I would like to thank all my chefs for making me truly successful at Riderwood and Charlestown. Without their passion, dedication and integrity these two communities would not be great places to work, live and play.